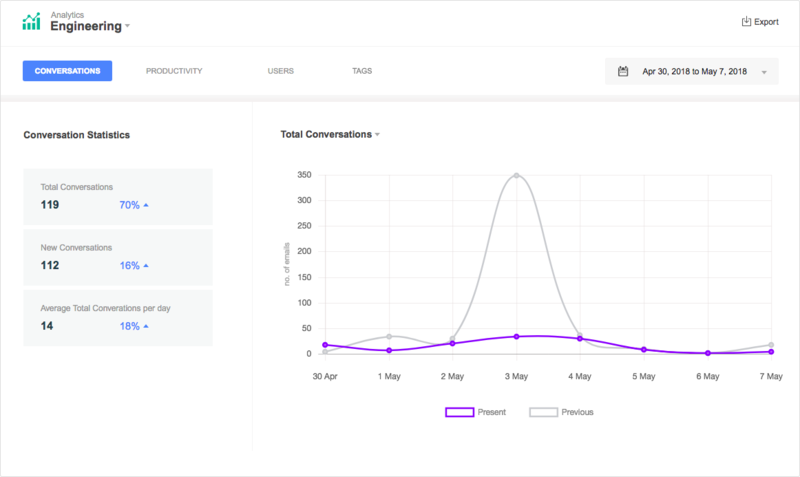 Hiver gives you reports/analytics for your Shared Mailboxes that help you understand how your team is doing, your email volume and areas for improvement. 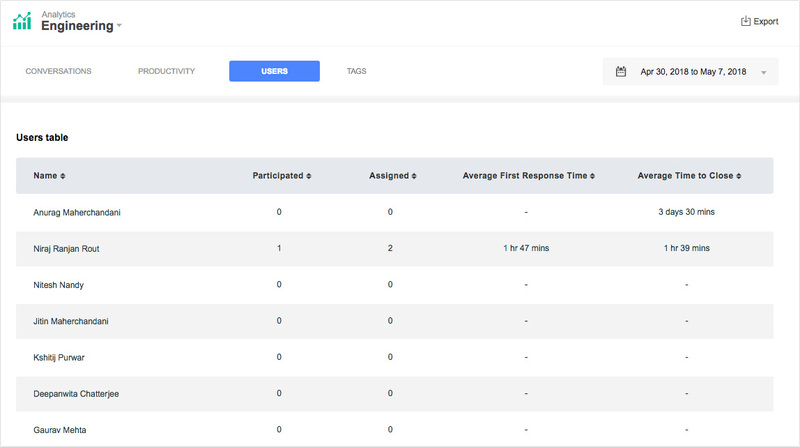 The reports provide an overview of all the important metrics for your team and also give you a breakdown of each metric at the individual team member level. You can access Reports/ Analytics for each of your Shared Mailboxes from the left pane of your Gmail. Click on the link 'Analytics' under the tab 'Shared Mailbox', in the left pane of your Gmail and key in the following parameters to access the Report. 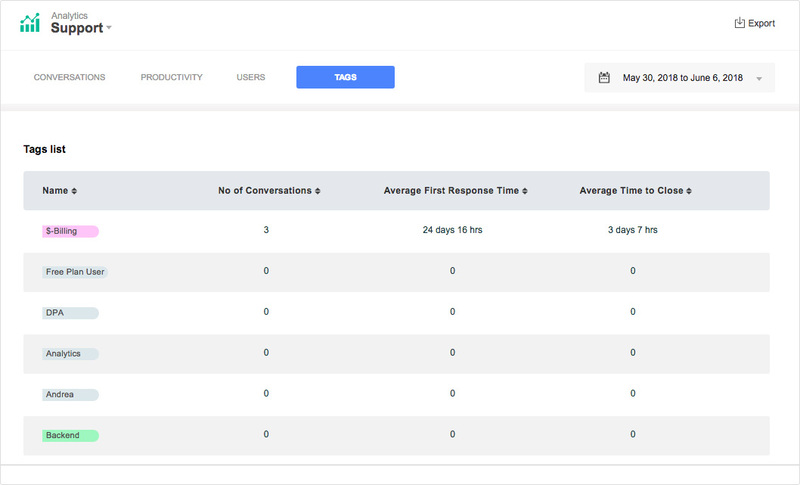 You can choose the duration for which you want to generate the report through the 'calendar' box. This is the first tab of the report and is about the volume of email conversations in your Shared Mailbox. The Conversation tab has two fields and for each of the fields, you can see the absolute value as well as the 'percentage' change. To calculate the percentage change, the data of the selected period is compared against the data of the immediately previous time period. eg if you choose a report for the month of May, it will compare against the data for the month of April and show you the percentage change. This metric refers to the number of new email conversation threads that have been added to the Shared Mailbox during that duration. Metric: The number at the left is the absolute number of new email conversation threads that were added to the Shared Mailbox during the selected time period. 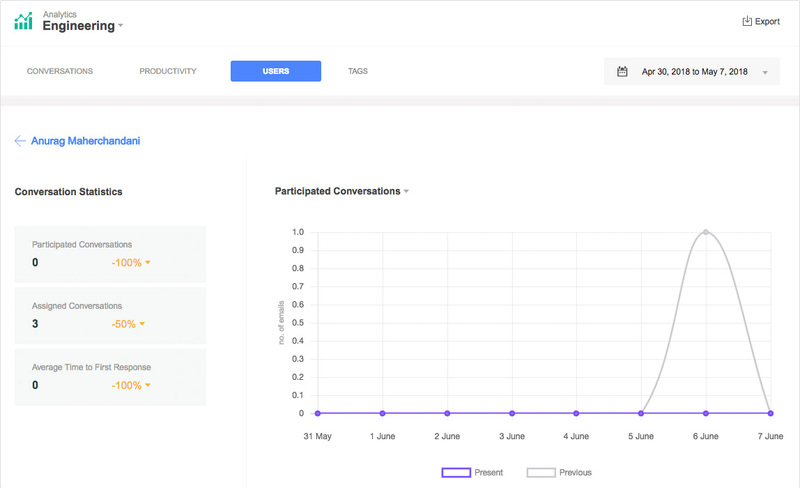 The number at the right is the percentage change in the number of new conversations received in the selected and previous time frames. Graph: A graph is plotted on the right which depicts the number of new conversations in the current and the previous time frame. x-axis: Represents the selected time period, broken down into equal sized portions. This metric refers to the average number of new email conversation threads that have been added to the Shared Mailbox during that duration. Metric: The number on the left is the average number of new email conversation threads that were added during the selected time period. The number on the right is the percentage change in the average number of new conversations received in the selected with respect to the previous time frame. Graph: A graph is plotted on the right which depicts the average number of new conversations in the current and the previous time frame. Please note that these reports refer to email conversation threads and not individual emails. This is the second part of the report which provides data on the productivity of the team. 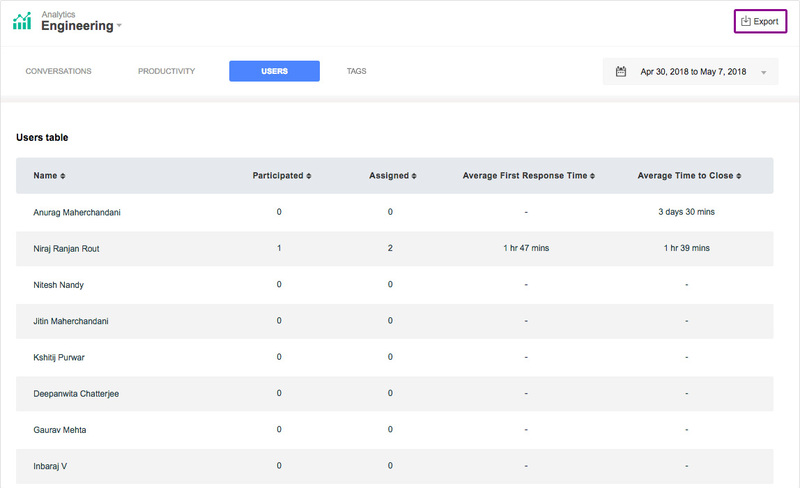 The Productivity tab has two fields and for each of the fields, the absolute, as well as the percentage change, is given. Percentage change is calculated in the same way as mentioned for the fields of the Conversations tab. This metric refers to the number of email conversations that have been closed by the team during the selected time frame. Metric: The number at the left is the absolute number of email conversation threads that were closed during the selected time period. 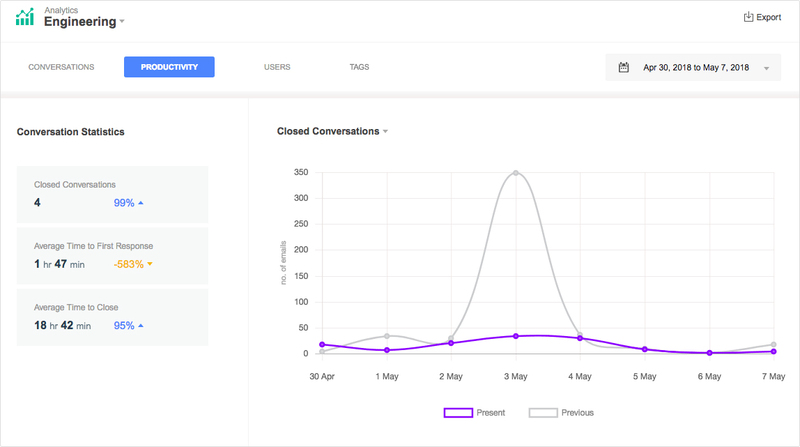 The number on the right is the percentage change in the number of closed conversations in the selected and previous time frames. Graph: A graph is plotted which depicts the number of closed conversations in the current and the previous time frame. This metric will help you figure out how fast the team responds to a new email. This just considers the first response and not whether the state of the email was changed to 'closed' or not. The first response time is the time taken to reply after an email thread has been assigned. Metric: The number on the left is the average time to first response during the selected time period. The number on the right is the percentage change in the average time to first response in the selected and previous time frames. Graph: A graph is plotted which depicts the average time to first response in the current and the previous time frame. This metric will reflect how much time it takes for the team to 'close' a query. This is based on the duration of time the email thread was in 'open' state. While calculating 'Average time to close', the time that an email/ email thread was in 'Pending' state will not be taken into consideration. Metric: The number on the left is the average time to close email conversations during the selected time period. The number on the right is the percentage change in the average time to close in the selected and previous time frames. Graph: A graph is plotted which depicts the average time to close email conversations in the current and the previous time frame. In this tab, all the data is drilled down at the individual user level. This part shows how many emails were assigned to a user, in how many emails she participated, the average time taken by her for the first response and the average time taken by her to close the emails. While calculating 'Average time to Close' only the duration in which an email was in 'Open' state is considered. The duration in which an email was in 'Pending' state is not considered. When you click on any user's name, you will be able to see further details about the user. This is the fourth part of the report where metrics are shown for the Tags created in the Shared Mailbox. In this tab metrics, data associated with each tag is shown. This shows the total number of emails labeled with a particular Tag, the average first response time for all the emails labeled with each Tag and the average time taken to close the emails labeled with that Tag. Click on the 'Export' button to start the export. You will receive the link from where you can download the report in your email with the subject 'Hiver analytics export for your shared mailbox is ready'. 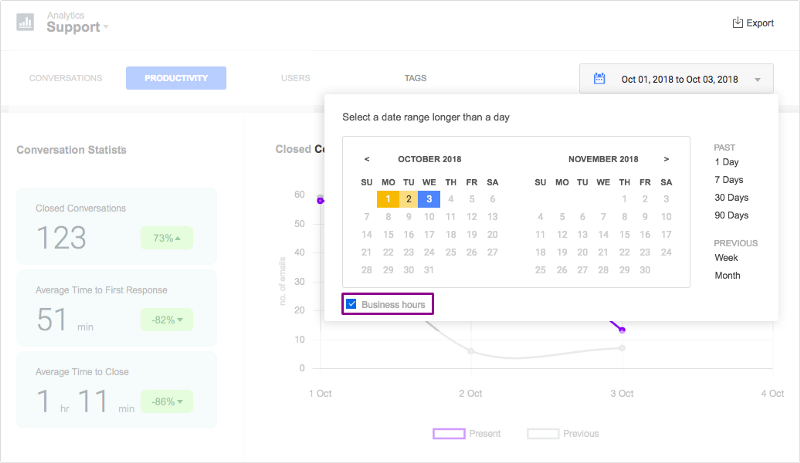 Enabling Business Hours to filter reports will help you gain accurate insights into how your team is doing, your email volumes, and areas for improvement. Hiver admins, who are not added as users in any Shared Mailbox can also view the performance of their teams by just installing the extension. To filter the reports by Business hours, tick the Business Hours checkbox at the bottom left corner of the calendar. Please note that the reports are available only for Hiver accounts that are on the Premium and Enterprise plans and in the 14 day trial period. If you’re on a different plan and want to access reports, please write to us on support@hiverhq.com.